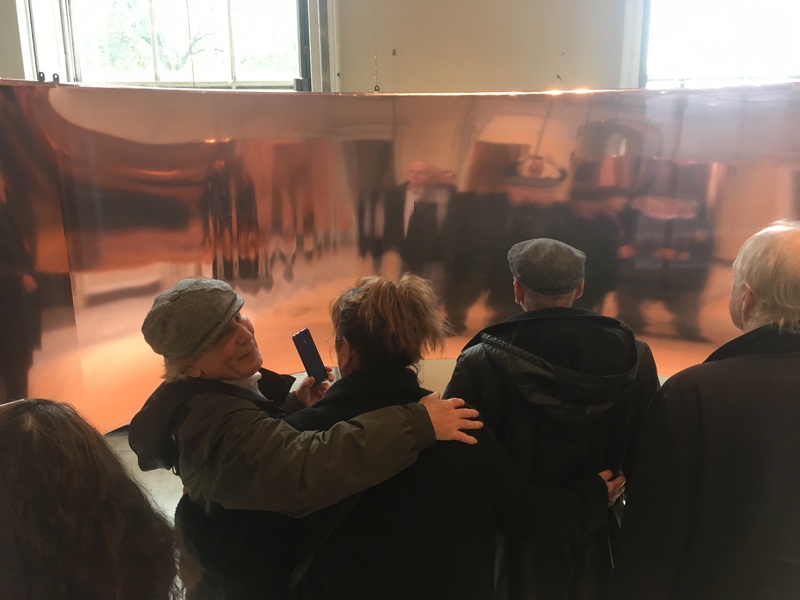 On arrival to Somerset House the group viewed a small exhibition known as the ‘Ruga Series’. A contemporary artisit from South Africa explored themes of ‘alternative worlds and possible futures’ using a modern perspective. As the group calmly dispersed around the gallery, absorbing the colourful art work, a very awkward gallery attendant seemed to spark a feeling of negativity…passing a very condescending glare. We felt that this was highly uncalled for as we only had intentions to appreciate the art, not to take it home with us! Did this stop us ? No! However, at this very moment where we realised we were short of one person…Unsure of where Fatima had escaped to we carried on our trip, keeping a close eye out for her. We wandered slowly over to the next exhibition. Here we viewed some instillation art by a young British artist named Hannah Perry. This exhibition called Gush, aimed to explore themes of mental health in relation to our self-concept, on how we view ourselves when experiencing trauma or psychological disorders. We saw different images with metallic effects, and a huge wobbling copper screen in which we could see a warped version of our reflections. This showed us the distortion that psychological disorders may prove. Here we took some pictures and video footage. Coincidentally we ran in to the famous Hannah Perry just minutes later. Being a friend of Kim and the Deputy Curator, she kindly offered to show us around the staff only side of the building, talk about VIP’s! Here we viewed a former inland revenue part of the building that had been converted into a gallery for young artists. There was some very interesting decor and a number of large pool tables in some of the work- space s. We also viewed a former rifle range, where real shooting used to be practiced. It’s a good thing the room is sound proof! We stopped for a bite of lunch in the foyer were we had a small discussion about the next exhibition which was at a different location not far from Somerset House. Strange Days (our final destination) is a Gallery based around film, with an abstract theme. There was a film which was projected onto the ceiling with beds to lay on. They used this to create an underwater theme and music to create an ambience, the room was also dark so it really created a mood of relaxation. We also have some footage of this. The longest film in the gallery, also one of Kim’s favourites, was six hours and nine minutes. A lot Of Sorrow is a band of musicians playing repeatidly for the duration, the same song over and over again. Unfortunately we couldn’t stay that long and called it a day. If you are wondering, our missing member decided to go to the National Gallery, with a friend she encountered in Somerset House.